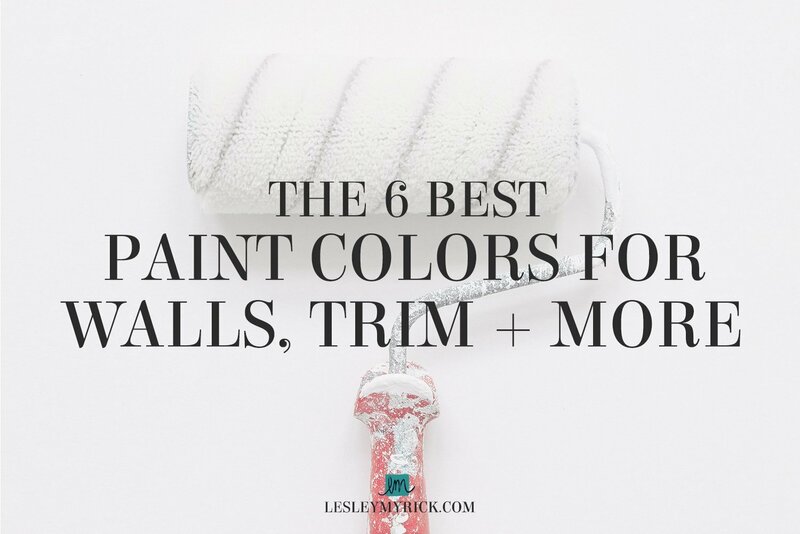 Now, don’t die of shock: 4 of the 6 best paint colors for walls, trim, and cabinets I’ve chosen are neutrals. 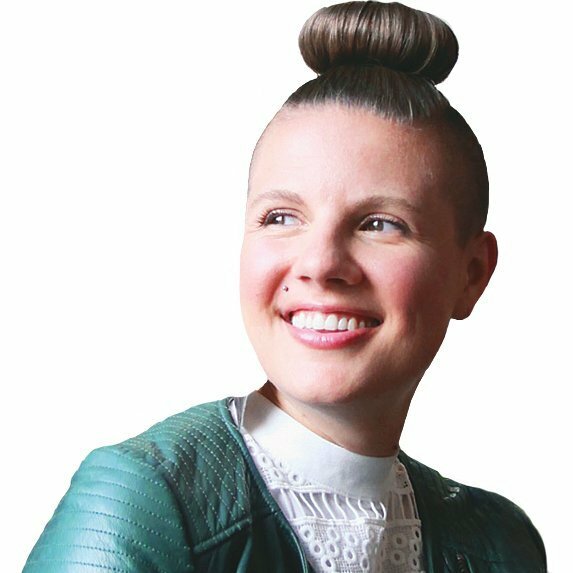 Your color-loving designer pal has chosen white, greys, and even BEIGE as her favorites! There is a method to my madness, I promise. While a dramatic wall color can be awesome in certain rooms (like my Dark Night bedroom below), most of the time your walls are best treated as the backdrop and not the center of attention. 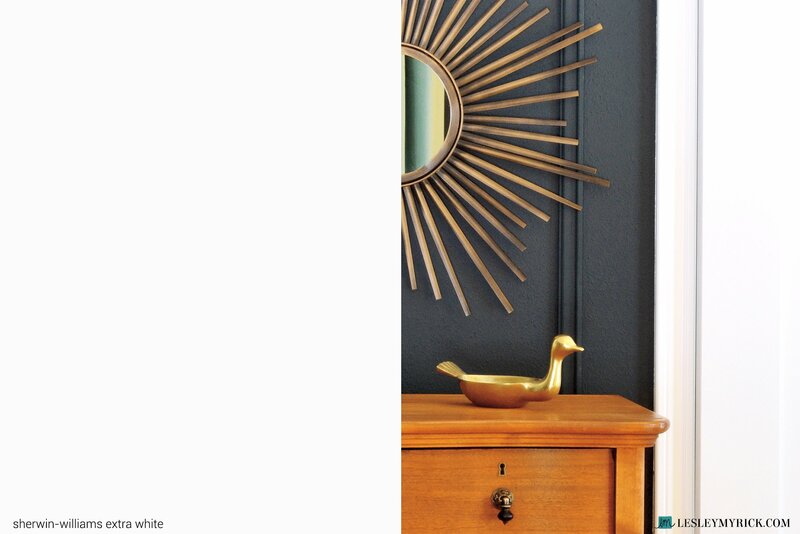 Paint is cheap, and is meant to highlight the other amazing parts of a room design. No one wants to invest thousands in gorgeous living room furnishings and decor only for their friends to comment on how much they loooooove that $30 wall color! So, what are my favorite paint colors? I’m glad you asked. Dark Night is the artsty cool girl in highschool who wears killer eye makeup and oozes confidence, and you just want to be around her and hope some of her cool-factor rubs off on you. I’ve loved my living room in Relaxed Khaki. 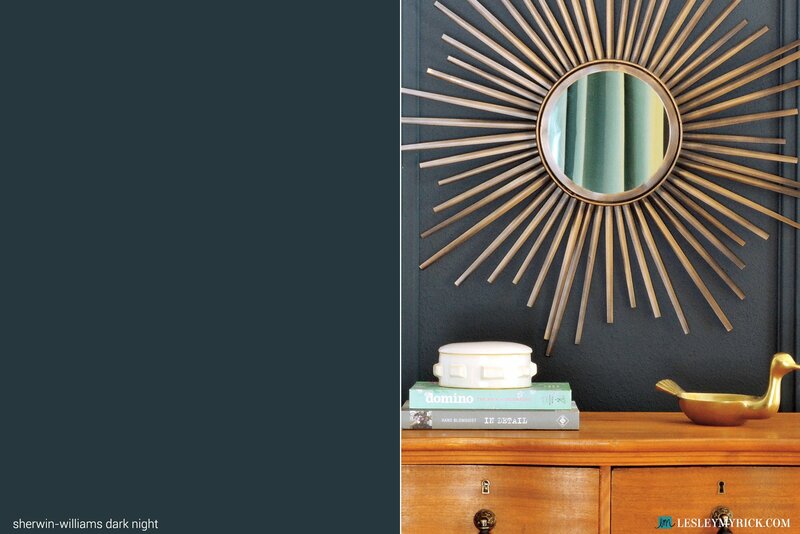 Crazy how different it looks in the space than on this color swatch, right? It’s not beige (despite kind of looking like it…shhh!) 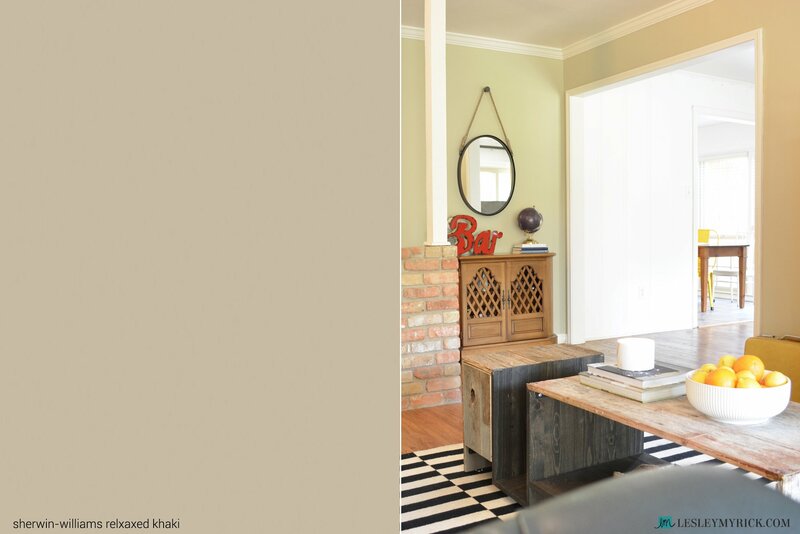 but is an easy, livable, earthy neutral. In my home it really reads as green, but in other spaces it looks more like a true khaki. Relaxed Khaki is like that hot dad at the playground – he’s not what you’d usually go for and is more boring and stable than you are, but somehow that’s really attractive. Anyone else start singing “Aaaamazing graaay, how sweet the sound”…? 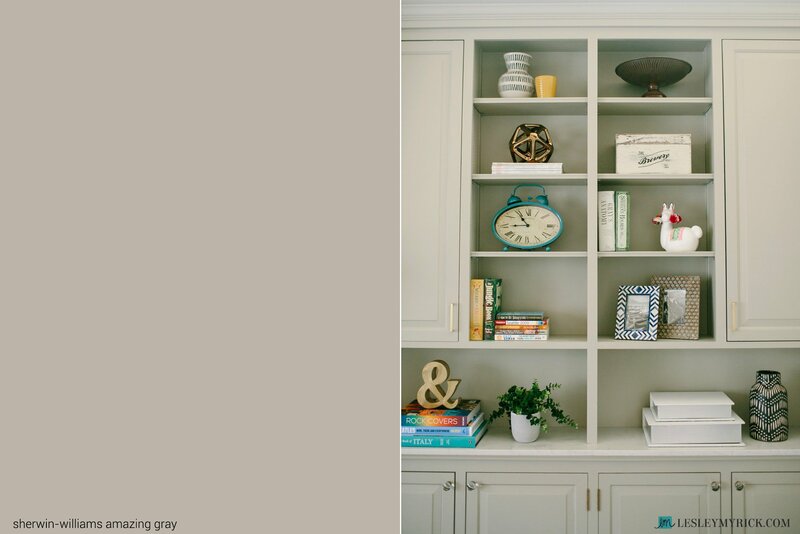 Amazing Gray is a great medium gray that I’ve used on cabinetry before and loved the results. It’s not too purple or blue, and it pairs really nicely with marble and metallics. Amazing Gray is kind of cocky (I mean really, that name!) but you can’t argue with the fact that he really is pretty amazing. 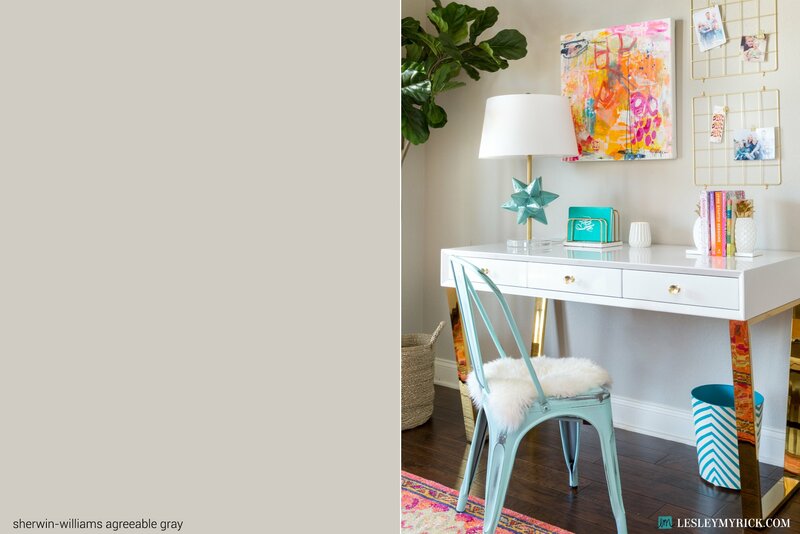 Just like 7Up is the “agreeable soda” – meaning that pretty much everyone will drink it even if it’s not their absolute fave – Agreeable Gray is a pretty safe bet for your walls. It’s light, soft grey that runs just a little on the greige side with a touch of brown in it. I like to design with a LOT of color (hello, have we met?) and Agreeable Gray creates the perfect neutral canvas so that the art, lighting, furnishings, and rugs can take all the attention. Agreeable Gray is like your boring neighbor that you like just fine, but he’s not the most charismatic guy. But you just like him, you know? Even if you can’t always remember his name. I’ve had my fair share of battles with white paint, and I’ve found a hands-down winner – Extra White. It’s not too yellow, not too blue, and really pops against bright and rich colors. All of my interior doors and trim and ceilings are in Extra White. So fresh and so clean. Extra White is totally the over-achiever (you know: class president, valedictorian, straight-A student) of whites, and no other white even comes close. But he deserves all the accolades, even if you’re a little jealous of his success. Citron is like, THE BEST yellow-green ever. Benjamin Moore says that, “a generous dose of green gives this earthy, organic yellow a mellow, somewhat mysterious quality.” Mysterious? I don’t know about that. 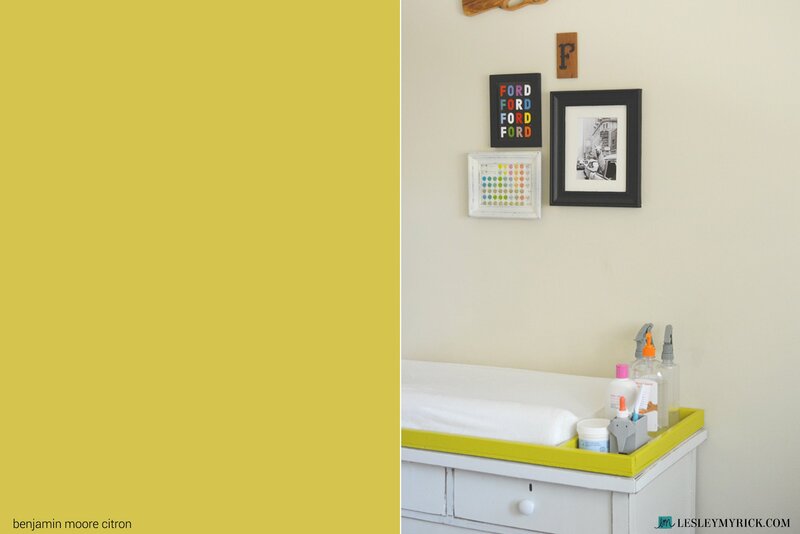 But I DO know that this electric chartreuse is my fave for adding a burst of color to a baby change table (which we did in Ford’s nursery), an interior door, or an accent table. Citron is like biting into a lemon and making a killer sour face, but secretly you really like it and will probably do it again. And hey – I’d love to hear about your favorite paint colors. Join me LIVE on Facebook every Wednesday at noonCT for the Bust Out Of Boring show and we’ll chat about colors you love (or colors you’ve seen that you totally hate).